I am excited to participate in the annual giveaway at Sew Mama Sew! For your consideration I have three yards of fabric. It's new and unwashed. I believe it was purchased at JoAnns. I like these for some summer tote bags. Summer dresses for my girls! Thank you for this give-away! I would love to make another Tinny Dress (http://www.straight-grain.com/2013/06/4-collars-3-skirts-2-sleeves-1-pattern.html) for my daughter. If it didn't end up in a quilt those fabrics would make terrific doll dresses for my granddaughters. Thanks for the great giveaway. Clothes for my daughters. The fabric is gorgeous (as always!). Thank for the giveaway! Clothes for my two girls! They'd be great in a quilt! I would make doll clothes with the fabric. I would use them in quilts! Mug Rugs and mini quilts for friends! I would use them in lap quilts! Table runner! Thanks for the opportunity! I am certain it would go towards dresses for my daughter! These would make adorable summer frocks for my little girl!! Such fun fabrics. Perfect for summer! I would probably make a romper for a my baby girl, or possibly a picnic blanket. This fabric is too cute. They would make a great tote bag. Thanks for the giveaway! A quick quilt for my kid's teacher. I would make myself a skirt out of these. Super fun summer fabric! pieced quilt backings! I'm always looking for fabrics for that! Skirts for my granddaughters. They are always asking for fun fabric to sew. Thanks. These look perfect for little sundresses. I would make a blouse or two for my daughters! I think I would use this fabric to make pillowcases for the 1 million pillowcase challenge from AQS! For someone that doesn't like green..those are rather appealing! I also wasn't into purple much, but this past year...most everything I made had purple in it so maybe green is my new color! They are just pretty and springy! That fabric is adorable! It would make a beautiful and cheery table runner. I would make a baby quilt for a friend who is expecting! I would make a picnic quilt for summer! My kids are in desperate need of bedside book organisers, so I'd make a few of those. I think I would make a quilt with these. Or at least use them in quilts. I am in need of binding, that would be great! I would use them in a quilt or two! Thanks! I would love to make some bias tape - these colors are so pretty and I would love to highlight the fabric on everything! They would either be worked into the next quilt or go into dresses for the baby! 3 yards, awesome, they would look really cute as a dress for my daughter, or the backing on quilts I make for charity. This would be a cute outfit for my little granddaughter and maybe enough left for her doll a matching outfit! Love this fabric!! I'm sure I would make a quilt. I think a bag and some accessories would work very well with this prints. thanks for the chance! I would like to make a top for my daughter. Thanks for the lovely give away. I would happily use this fabric for little girls pretty dresses or for the bags I like to make. Those greens are perfect for some place mats for my dining table. I will put them in a baby quilt! I might make a skirt with them. They're so fun! definitely part of a quilt! I would make summer dresses for my two girls. Great summer colors! Some kind of bag. Thanks for the opportunity. For pillowcases or as part of a quilt. Thanks for the chance at your giveaway. I will make a sleep sack for my upcoming new baby. Thanks for the giveaway! The colors are great, but I would have to wait to feel them and see them with my stash to be inspired for a project. I would make a cushion for my new sewing table and chair! thanks for the chance to win. I would make pouches or a tote bag. To be honest I'm not sure. Maybe something for one of my granddaughters. Thanks for the chance to win. I would use them in bright, colorful quilts. I think that these would be great additions to my stash. I don't know off had what I would do with them, though they are good colors and I'm sure I would find them a home. I`d make a bed runner! I'd make some geranium dresses! A bag for my daughter Katelyn. These would make great placemats, napkins or tote bags..... or used in a quilt. I like to let the fabric tell me what to make with it! I will make dresses for my little granddaughter, Nellie. I will make some little dresses or tops for my 2 yo granddaughter. Probably a purse - those are my favorite project! I think they would make cute skirts or shorts for my granddaughter. Thanks. Spring dresses for my granddaughters! Thanks for the chance. Some dresses for my three girls! Skirts for my girls or include it in a quilt. So pretty! I would make a bag. I think a table runner or summer PJ's. I will make summer dresses for my 9 yr old and my nearly 7 year old granddaughters - I would mix the fabrics together - probably make a tiered skirt or ruffles, and a sunhat to wear with them. If there is enough left over then I would absolutely make a summer outfit for each of their 18" dolls - nothing like having matching dresses!!! Lovely fabrics. Thanks for the chance to win it. Thanks for the generous giveaway! 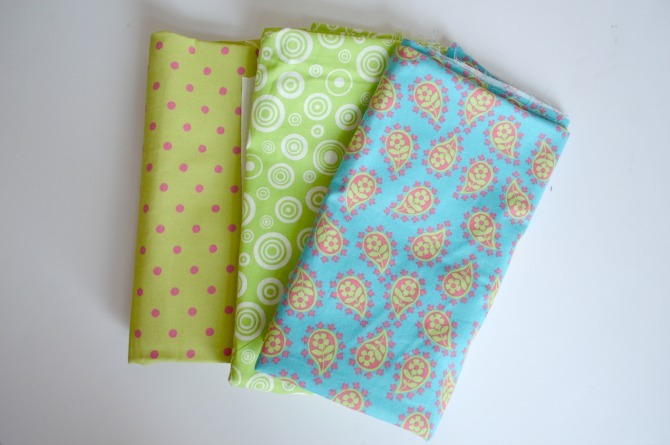 I would use these lovely fabrics in a summer quilt, along with some florals. And thanks for your inspiring blog. I sew for my granddaughter, so I enjoyed looking through your tutorials. I want to make a Blue Mountain Ridge queen-sized quilt using the pattern from Bonnie Hunter first. I need to start making a couple of baby quilts. This material would sure come in handy and will go with any blender fabric in my stash. Thank you for being a part of the Sew Mama Sew Giveaway and being so generous with your giveaway. this would make the best apron! i've been meaning to make one for some time and just haven't gotten around to it. I would make baby clothes - something pretty for my grand daughter, due in late July! a summer dress for a little girl. Thanks for the chance to win. I'd likely use it on some charity baby quilts. This would make a great skirt for my daughter ! I would make ruffled skirt for my little girls. I'd make a picnic quilt! I would use for quilt backs for my kids charity quilts. I'd use it for a quilt. Thanks for the chance! I would love to make some pillows with this fabric and use in a lap quilt I'm making. Thanks for the giveaway! Probably skirts for my daughters. A quick charity quilt. Oh so cheery fabric! 3 yards! I can make anything! a bag...a dress for me...some clothes for my kiddos...oh the possibilities! My daughter and I need Kindle covers! this would be perfect - thank you! I'd make a dress/skirt for my daughter. I would put it into a quilt. I would probably make a lining for a purse? Or something for my granddaughter! Beautiful fabric. I would love to use it to make sundress for my daughter and crayon/art kits for both kids. I'd use them to make clothes for my 2 y/o girl! Summer skirts for my little monkey. Maybe some pillowcases? Thanks for the chance to win! i might use it to make a sew together bag. I think I would add some more pink & make sundresses for my twin granddaughters, age 4. I will make some little boy pants. Another prayer quilt, maybe a pretty skirt too. I would make pillows for my girls! Thanks so much for this great giveaway! I think those fabrics would make a fabulous bag! Thanks for the lovely giveaway. I have been making baby quilts lately for Project Linus, and I think this fabric would be just perfect for that. LOVE these blues and greens together. Would be used in new grandbaby quilt. I would love to use it for baby gifts, tiny blankets or maybe crinkle-toys (I like making flat elephants with plastic sewn into them for gifts) Thanks for the giveaway! I would make a picnic quilt. Thanks for the chance to win! A dress or a skirt for my little Miss! i would make some pretty pillowcases for the summer. Maybe a tiered skirt---but more likely something quilty! Cute kids! I would make something for my girls. Thanks for the chance to win! beautiful fabric. I'd love to make a skirt for myself. I think it would make a lovely tote bag for a yoga mat. I would use these to make a quilt top for my group, World of Charity Stitching. I'll be making tote bags! Something summery for the wee one! Lovely bright fresh colours. Thanks for the chance! I also really love the fabric used in the Norah's dress you made. Just stunning. I'd like to make something for my little granddaughter. Thanks for participating in the Giveaway Day. This fabric looks like it would make a cute play diaper bag for my 3 year old granddaughter who is expecting a brother in July! Thanks for the Chance! The colors are bright and springy looking so would make a nice tote bag! I'd make cute matching dresses for my best friends little girls! Either a quilt or zippered pouches. Thanks for the chance to win! • • • Gift Bags. Thank you for sharing! Would use them in a quilt! Dress for my 2 year old daughter! I'll make a dress for my preschooler! I'd make a fun summer handbag - yum!! Dress, skirt or blouse, i'm not sure yet. I think I would use it in making bags or pillow cases. I will definitely make something cute for my kids! I would use it in making blocks for quilting. Thanks!